"SUNY" redirects here. For the American historian, see Ronald Grigor Suny. For the City University of New York, see City University of New York (CUNY). For other and similar uses, see University of New York (disambiguation). The State University of New York (SUNY /ˈsjuːni/) is a system of public institutions of higher education in New York, United States. It is the largest comprehensive system of universities, colleges, and community colleges in the United States, with a total enrollment of 424,051 students, plus 2,195,082 adult education students, spanning 64 campuses across the state. Led by Chancellor Kristina M. Johnson, the SUNY system has 91,182 employees, including 32,496 faculty members, and some 7,660 degree and certificate programs overall and a $10.7 billion budget. SUNY includes many institutions and four university Centers: Albany (1844), Binghamton (1946), Buffalo (1846), and Stony Brook (1957). SUNY's administrative offices are in Albany, the state's capital, with satellite offices in Manhattan and Washington, D.C. SUNY's largest campus is the University at Buffalo, which also has the greatest endowment and research funding. The State University of New York was established in 1948 by Governor Thomas E. Dewey, through legislative implementation of recommendations made by the Temporary Commission on the Need for a State University (1946–1948). The Commission was chaired by Owen D. Young, who was at the time Chairman of General Electric. The system was greatly expanded during the administration of Governor Nelson A. Rockefeller, who took a personal interest in design and construction of new SUNY facilities across the state. 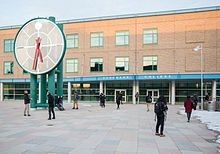 Apart from units of the City University of New York (CUNY), SUNY comprises all other institutions of higher education statewide that are state-supported. The first colleges were established privately, with some arising from local seminaries. But New York state had a long history of supported higher education prior to the creation of the SUNY system. The oldest college that is part of the SUNY System is SUNY Potsdam, established in 1816 as the St. Lawrence Academy. In 1835, the State Legislature acted to establish stronger programs for public school teacher preparation and designated one academy in each senatorial district to receive money for a special teacher-training department. The St. Lawrence Academy received this distinction and designated the village of Potsdam as the site of a Normal School in 1867. On May 7, 1844, the State legislature voted to establish New York State Normal School in Albany as the first college for teacher education. In 1865, the privately endowed Cornell University was designated as New York's land grant college, and it began direct financial support of four of Cornell's colleges in 1894. From 1889 to 1903, Cornell operated the New York State College of Forestry, until the Governor vetoed its annual appropriation. The school was moved to Syracuse University in 1911. It is now the State University of New York College of Environmental Science and Forestry. In 1908, the State legislature began the NY State College of Agriculture at Alfred University. In 1946-48 a Temporary Commission on the Need for a State University, chaired by Owen D. Young, Chairman of the General Electric Company, studied New York's existing higher education institutions. It was known New York's private institutions of higher education were highly discriminatory and failed to provide for many New Yorkers. Noting this need, the commission recommended the creation of a public state university system. In 1948 legislation was passed establishing SUNY on the foundation of the teacher-training schools established in the 19th century. Most of them had already developed curricula similar to those found at four-year liberal arts schools long before the creation of SUNY, as evidenced by the fact they had become known as "Colleges for Teachers" rather than "Teachers' Colleges." Resolved that the President be, and hereby is, authorized to take such steps as he may deem appropriate to implement this policy, including the determination of which student organizations are social as distinguished from scholastic or religious, and his decision shall be final. Despite being one of the last states in the nation to establish a state university, the system was quickly expanded during the chancellorship of Samuel B. Gould and the administration of Governor Nelson A. Rockefeller, who took a personal interest in the design and construction of new SUNY facilities across the state. Rockefeller championed the acquisition of the private University of Buffalo into the SUNY system, making the public State University of New York at Buffalo. 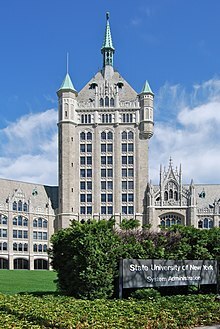 SUNY is governed by a State University of New York Board of Trustees, which consists of eighteen members, fifteen of whom are appointed by the Governor, with consent of the New York State Senate. The sixteenth member is the President of the Student Assembly of the State University of New York. The last two members are the Presidents of the University Faculty Senate and Faculty Council of Community Colleges, both of whom are non-voting. The Board of Trustees appoints the Chancellor who serves as SUNY Chief Executive Officer. The state of New York assists in financing the SUNY system, which, along with CUNY, provides lower-cost college-level education to residents of the state. SUNY students also come from out-of-state and 171 foreign countries, though tuition is higher for these students. Although tuition is higher for these non-resident students, their tuition is subsidized by New York State taxpayers. There is a large variety of colleges in the SUNY system with some overlap in specialties between sites. SUNY divides its campuses into four distinct categories: university centers/doctoral-granting institutions, comprehensive colleges, technology colleges, and community colleges. SUNY also includes statutory colleges, state-funded colleges within other institutions such as Cornell University and Alfred University. Students at the statutory colleges have the benefit of state-subsidized tuition while receiving all of the campus life amenities of the host institutions. SUNY and the City University of New York (CUNY) are different university systems, both funded by New York State. Also, SUNY is not to be confused with the University of the State of New York (USNY), which is the governmental umbrella organization for most education-related institutions and many education-related personnel (both public and private) in New York State, and which includes, as components, the New York State Education Department and the New York State University Police. Courtney Eagles Burke Senior Vice President and Chief Strategy Officer at Albany Medical Center. Previously served as New York State's Deputy Secretary for Health for Governor Andrew M. Cuomo from 2013-2015. Robert Duffy President and Chief Executive Officer of the Greater Rochester Chamber of Commerce. Previously, he served as New York lieutenant governor in Governor Andrew M. Cuomo's administration from January 2011 to December 2014. Stanley Litow Vice President of Corporate Citizenship & Corporate Affairs at IBM and President of IBM's Foundation. Previous public and non-profit leadership includes service as Deputy Chancellor of the New York City Public Schools, and founder and CEO of Interface, a nonprofit think tank. July 1, 2015 - June 30, 2022. Edward Spiro Partner at Morvillo Abramowitz Grand Iason & Anello P.C. Mr. Spiro is also a member of the Departmental Disciplinary Committee of the Appellate Division, First Department and a member of the House of Delegates of the New York State Bar Association. June 22, 2016 - June 30, 2020. Nina Tamrowski President of the SUNY Faculty Council of Community Colleges. She is also a professor of Political Science at SUNY Onondaga Community College. The SUNY Board of Trustees has a voting student member on the board. The student trustee serves a dual role as the President of the Student Assembly of the State University of New York (SUNYSA). SUNYSA is the recognized student government of the SUNY system. In the 1970s, students pressed for voting representation on the governing board of SUNY colleges. In 1971, the State Legislature added five student voting members to Cornell's Board of Trustees. However, at that time, all members of a board must be over the age of 21 for a corporation to hold a liquor license, so to allow Cornell to retain its license, the legislature had to go back to amend NYS Alcoholic Beverage Control Law § 126(4) to require half the board must be 21. In 1975, the legislature added a non-voting student seat to the boards of all SUNY units. Two Attorney General of the State of New York opinion letters reduced the parliamentary rights of the student members to participate at meetings and indicated they were not in fact Public Officers, and arguably subject to personal liability from lawsuits. In 1977, another statutory amendment made student members of SUNY councils and boards subject to the NYS Public Officers Law or NYS General Municipal Law and granted student representatives parliamentary powers of moving or seconding motions and of placing items on the agendas of the bodies. Finally, the legislature gave full voting rights to the student members in 1979, resulting in the students of all SUNY units having voting representatives, except for the NYS College of Environmental Science and Forestry. Finally, in 1986, the legislature gave the student representative of that college voting rights as well. Location of SUNY campuses within New York state. Black: University centers; Red: Other doctoral-granting institutions; Yellow: Comprehensive colleges; Green: Technology colleges; Blue: Community colleges. SUNY's sole law school is the University at Buffalo School of Law. All of these colleges are in New York State, except that the Jamestown Community College operates its Warren Center in Pennsylvania under a contract with the Warren-Forest Higher Education Council, and the Center is licensed by the Pennsylvania Department of Education. 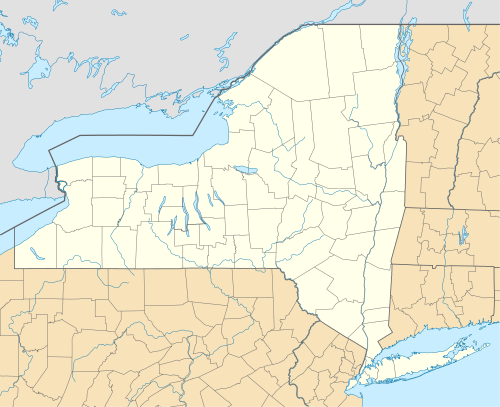 The Warren Center is 25 miles south of Jamestown, New York on the grounds of Warren State Hospital, in North Warren, Pennsylvania. For the 2017-2018 academic year, tuition costs at SUNY schools for an undergraduate degree are less than two-thirds the cost of most public colleges in the United States. For example, tuition at the University at Buffalo for an undergraduate degree is $9,828 per semester or $27,068 per year for non-resident students. Undergraduate tuition for non-resident students at the University of Maryland is $35,216 per year. Non-resident tuition and fees at University of Oregon are $32,535 per year. New York State also offers free tuition for all public college and universities for families who have an income of lower than $125,000 and are residents of the state. Other requirements to qualify for free SUNY education include full-time enrollment and staying in the state for a number of years after graduating. New York's largest public university is the State University of New York at Buffalo, which was founded by U.S President and Vice President Millard Fillmore. Buffalo has an enrollment total of approximately 30,000 students and receives the most applications out of all the SUNY's. The SUNY Chancellor's Award for Student Excellence is an annual award given out by the SUNY system to distinguished student leaders across the State of New York. Established in 1997, the system considers the Chancellor's Award to be "the highest honor bestowed upon the student body." Every school within the SUNY system manages its own athletics program, which greatly varies the level of competition at each institution. The four university centers compete at the Division I level for all of their sports. All but Binghamton field football teams, with Buffalo in Division I FBS (formerly Division I-A) and Albany and Stony Brook in Division I FCS (formerly Division I-AA). The four Cornell statutory colleges compete as part of the university as a member of the Ivy League, an FCS conference that chooses not to participate in the FCS postseason tournament. A small number of community colleges compete at the NJCAA Div. 1 level. Most SUNY colleges, technical schools and community schools compete at the NCAA or NJCAA Div. II or III level. SUNY Delhi is a member of the NAIA. SUNY Canton and SUNY Environmental Science and Forestry are members of the USCAA. The most prominent SUNY rivalry is between the Albany Great Danes and Binghamton Bearcats. The two belong to the America East Conference. Frequently referred to as the I-88 Rivalry, Binghamton and Albany sit at either end of Interstate 88 (roughly 2.5 hours apart). Both teams are known to post the highest visitor attendance at either school's athletic events. Both schools also have less intense rivalries with a fellow America East member, the Stony Brook Seawolves. In football, a sport not sponsored by the America East, Albany and Stony Brook have a rivalry in the Colonial Athletic Association. SUNY Buffalo tends to have a rivalry in basketball with two private colleges in the same geographical area. Canisius College and Buffalo's South Campus are 2.5 miles apart on Main St. in Buffalo. Their other rival is Niagara University in Lewiston, NY. SUNY Oswego and SUNY Plattsburgh also share a notable rivalry in Division III Hockey, with that game almost always having the SUNYAC regular season title up for grabs. SUNY Cobleskill and SUNY Delhi rivalry focuses on basketball, cross country, and previously track, although Cobleskill track and field started competing at the NCAA Division III level in spring 2009. The SUNY Delhi 2003-2004 basketball season was canceled after a basketball game was called with 48 seconds left after several SUNY Delhi basketball players nearly started a brawl in the Ioro Gymnasium at SUNY Cobleskill on Wednesday February 4, 2004. SUNY Oneonta has developed a rivalry in almost every sport with SUNY Cortland. They share the red dragon as a team nickname, and their matchups are known as the "Battle of the Red Dragons". There is an unusual sports rivalry between SUNY College of Environmental Science and Forestry and Finger Lakes Community College, with both campuses sponsoring nationally ranked teams in woodsman competitions. ^ a b c SUNY. "SUNY FAST FACTS". Retrieved 3 August 2017. ^ "Short History of SUNY". The State University of New York. SUNY. Retrieved 2009-04-05. ^ Applebome, Peter (2010-07-23). "The Accidental Giant of Higher Education". NYTimes.com. Retrieved 2011-11-10. ^ "SUNY: Complete Campus List". Suny.edu. Retrieved 2011-11-23. ^ "2009-10 Tuition and Fee Rates: A National Comparison" (March 2010). Washington Higher Education Coordinating Board. Retrieved July 15, 2018. ^ "Tuition and Fees at Flagship Universities Over Time." The College Board (Trends.CollegeBoard.com). Retrieved July 16, 2018. ^ ""Remarks by Governor Eliot Spitzer"". The Governor's Site. Retrieved April 30, 2015. ^ a b "Rankings by total R&D expenditures". National Science Foundation. Archived from the original on 2015-03-31. Retrieved 5 May 2015. ^ Tod Ottman, "Forging SUNY in New York's Political Cauldron," in SUNY at Sixty: The Promise of the State University of New York, ed. John B. Clark, W. Bruce Leslie and Kenneth P. O’Brien (Albany: State University of New York Press, 2010), 19. ^ "State U. Bans Social Societies on Bias Count". Cornell Daily Sun. 70 (15). 9 October 1953. p. 1. Retrieved 2010-10-06. ^ "SUNY Buffalo School of Management History". University at Buffalo. 2017. Retrieved October 4, 2017. ^ "Board of Trustees: H. Carl McCall, Chairman". Retrieved April 13, 2015. ^ "After Generations in Spotlight, Harlem Slips as Center of Black Politicks". Retrieved April 13, 2015. ^ "Board of Trustees: Joseph Belluck". Retrieved April 13, 2015. ^ "Board of Trustees: Eric Corngold". Retrieved April 13, 2015. ^ "Board of Trustees: Angelo Fatta". Retrieved April 14, 2015. ^ "Board of Trustees: Eunice Lewin". Retrieved April 14, 2015. ^ "Eunice Ashman Lewin". Retrieved April 14, 2015. ^ "Board of Trustees: Marshal Lichtman". Retrieved April 14, 2015. ^ "Marshall A. Lichtman, M.D." Retrieved April 14, 2015. ^ "Board of Trustees: Richard Socarides". Retrieved April 14, 2015. ^ "Richard Socarides". Retrieved April 14, 2015. ^ "Board of Trustees: Carl Spielvogel". Retrieved April 15, 2015. ^ "Board of Trustees: Cary Staller". Retrieved April 15, 2015. ^ "Student Members of the Boards of Trustees and College Councils". SUNY. May 28, 1986. Retrieved 2010-12-18. ^ "Binghamton University". binghamton.edu. Retrieved March 25, 2011. ^ "Stony Brook University". stonybrook.edu. Retrieved March 25, 2011. ^ "University at Albany". albany.edu. Retrieved March 25, 2011. ^ "University at Buffalo". buffalo.edu. Retrieved March 25, 2011. ^ "State University of New York College of Environmental Science and Forestry". esf.edu. Retrieved March 25, 2011. ^ "SUNY College of Optometry". sunyopt.edu. Retrieved March 25, 2011. ^ "SUNY Downstate Medical Center". downstate.edu. Retrieved March 25, 2011. ^ "State University of New York Institute of Technology at Utica/Rome (SUNY IT)". sunyit.edu. Retrieved March 25, 2011. ^ "Upstate Medical University". upstate.edu. Retrieved March 25, 2011. ^ "New York State College of Ceramics at Alfred University". nyscc.alfred.edu. Archived from the original on April 8, 2011. Retrieved March 25, 2011. ^ "Cornell University College of Agriculture and Life Sciences (CALS)". cals.cornell.edu. Retrieved March 25, 2011. ^ "Cornell University College of Human Ecology". human.cornell.edu. Retrieved March 25, 2011. ^ "Cornell University College of Veterinary Medicine". vet.cornell.edu. Retrieved March 25, 2011. ^ "Cornell University ILR School". ilr.cornell.edu. Retrieved March 25, 2011. ^ "Buffalo State College". buffalostate.edu. Retrieved March 25, 2011. ^ "Empire State College". esc.edu. Retrieved March 25, 2011. ^ "Purchase College". purchase.edu. Retrieved March 25, 2011. ^ "SUNY Geneseo". geneseo.edu. Retrieved March 25, 2011. ^ "State University of New York at New Paltz". newpaltz.edu. Retrieved March 25, 2011. ^ "State University of New York at Oswego". oswego.edu. Retrieved March 25, 2011. ^ "The State University of New York at Potsdam". potsdam.edu. Retrieved March 25, 2011. ^ "State University of New York College at Cortland (SUNY Cortland)". cortland.edu. Retrieved March 25, 2011. ^ "SUNY College at Oneonta". oneonta.edu. Retrieved March 25, 2011. ^ "SUNY Fredonia". fredonia.edu. Retrieved March 25, 2011. ^ "SUNY Plattsburgh". plattsburgh.edu. Retrieved March 25, 2011. ^ "The College at Brockport". brockport.edu. Retrieved March 25, 2011. ^ "The College at Old Westbury". oldwestbury.edu. Retrieved March 25, 2011. ^ "Alfred State College". alfredstate.edu. Retrieved March 25, 2011. ^ "Farmingdale State College". farmingdale.edu. Retrieved March 25, 2011. ^ "Morrisville State College". morrisville.edu. Retrieved March 25, 2011. ^ "SUNY Canton". canton.edu. Retrieved March 25, 2011. ^ "SUNY Cobleskill". cobleskill.edu. Retrieved March 25, 2011. ^ "SUNY Delhi". delhi.edu. Retrieved March 25, 2011. ^ "SUNY Maritime College". sunymaritime.edu. Retrieved March 25, 2011. ^ "SUNY Adirondack Community College". sunyacc.edu. Retrieved March 25, 2011. ^ "Broome Community College". sunybroome.edu. Retrieved March 25, 2011. ^ "Cayuga Community College". cayuga-cc.edu. Retrieved March 25, 2011. ^ "Clinton Community College". clinton.edu. Retrieved March 25, 2011. ^ "Columbia-Greene Community College". sunycgcc.edu. Retrieved March 25, 2011. ^ "Corning Community College". corning-cc.edu. Retrieved March 25, 2011. ^ "Dutchess Community College". sunydutchess.edu. Retrieved March 25, 2011. ^ "Erie Community College". ecc.edu. Retrieved March 25, 2011. ^ "Fashion Institute of Technology". fitnyc.edu. Retrieved March 25, 2011. ^ "Fulton-Montgomery Community College". fmcc.edu. Retrieved March 25, 2011. ^ "Genesee Community College". genesee.edu. Retrieved March 25, 2011. ^ "Herkimer County Community College". herkimer.edu. Retrieved March 25, 2011. ^ "Hudson Valley Community College". hvcc.edu. Retrieved March 25, 2011. ^ "Jamestown Community College". sunyjcc.edu. Retrieved March 25, 2011. ^ "Jefferson Community College". sunyjefferson.edu. Retrieved March 25, 2011. ^ "Mohawk Valley Community College". mvcc.edu. Retrieved March 25, 2011. ^ "Monroe Community College". monroecc.edu. Retrieved March 25, 2011. ^ "Nassau Community College". ncc.edu. Retrieved March 25, 2011. ^ "Niagara County Community College". niagaracc.suny.edu. Retrieved March 25, 2011. ^ "North Country Community College (The College of Essex & Franklin)". nccc.edu. Retrieved March 25, 2011. ^ "Onondaga Community College". sunyocc.edu. Retrieved March 25, 2011. ^ "Orange County Community College (SUNY Orange)". sunyorange.edu. Retrieved March 25, 2011. ^ "SUNY Rockland Community College". sunyrockland.edu. Retrieved March 25, 2011. ^ "Schenectady County Community College". sunysccc.edu. Retrieved March 25, 2011. ^ "Suffolk County Community College". sunysuffolk.edu. Retrieved March 25, 2011. ^ "Sullivan County Community College". sullivan.suny.edu. Retrieved March 25, 2011. ^ "Tompkins Cortland Community College (TC3)". tc3.edu. Retrieved March 25, 2011. ^ "Ulster County Community College (SUNY Ulster)". sunyulster.edu. Archived from the original on May 20, 2011. Retrieved March 25, 2011. ^ "Westchester Community College". sunywcc.edu. Retrieved March 25, 2011. ^ "University at Buffalo Law School". buffalo.edu. Retrieved August 14, 2017. ^ "JCC Warren, PA Center". Jamestown, New York: Jamestown Community College. Retrieved 2011-02-13. ^ "Tuition and Fees - SUNY". buffalo.edu. Archived from the original on 2017-10-22. Retrieved 2015-10-30. ^ "University of Maryland Costs". Umd.edu. Retrieved 2018-06-28. ^ University of Oregon. "Tuition - University of Oregon". Financialaid.uoregon.edu. Retrieved 2018-06-28. ^ Excelsior Scholarship Program. HESC.NY.gov. Retrieved July 16, 2018. ^ Jaschik, Scott (April 10, 2017). "New York Adopts Free Tuition." InsideHigherEd.com. Retrieved July 16, 2018. ^ "SUNY Buffalo: Complete Campus List". Suny.edu. Retrieved 2016-06-20. ^ "Chancellors and Presidents of the University". University of Buffalo, The State University of New York. Archived from the original on 2016-06-10. Retrieved 2017-04-12. ^ Hill, David J. (April 13, 2017). "Another Record-Breaking Year for Applications to UB." Buffalo.edu. Retrieved July 16, 2018. ^ "College profiles". New York: College Board. Retrieved 2010-06-08. ^ "State University of New York at Albany profile". collegeboard.com. New York: College Board. Retrieved 2015-09-19. 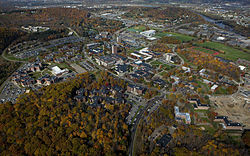 ^ "State University of New York at Binghamton profile". collegeboard.com. New York: College Board. Retrieved 2015-09-19. ^ "State University of New York at Buffalo profile". collegeboard.com. New York: College Board. Retrieved 2015-09-18. 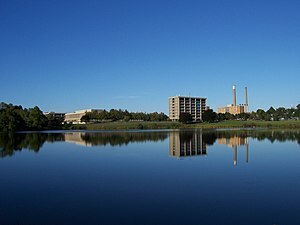 ^ "State University of New York at Stony Brook profile". collegeboard.com. New York: College Board. Retrieved 2015-09-19. ^ "About SUNY Canton Athletics". Retrieved 20 September 2014. ^ "USCAA.com". Retrieved 20 September 2014. Wikimedia Commons has media related to State University of New York.